More evidence that some brands never say die comes from a new collab between Maui & Sons and mall denim company American Eagle according to a story in Apparel News. On June 1, the denim-focused American Eagle will debut a collaboration line, called American Eagle x Maui and Sons, with the heritage surf brand, said Blake Harrington, executive vice president of licensing and business development at Maui and Sons, headquartered in Los Angeles’ Pacific Palisades neighborhood. . . The collaboration line will be available exclusively at all American Eagle doors, which number more than 1,000 stores in North America, China and Hong Kong. 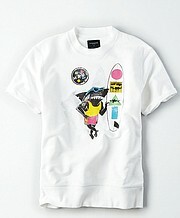 Seems like a really cheap way for American Eagle to get some quality retro, surf T-shirt graphics. Good on ya, zombies.